Golden Retrievers are friendly and sociable family dogs which have earned a place in the lives of many American families. These popular hunting dogs, are known to be intelligent but too friendly to make a proper guard dog for the home. 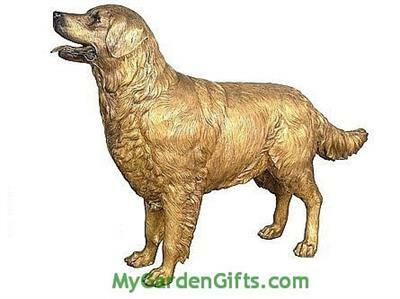 Our life size Golden Retriever comes beautifully hand finished and a lovely addition for a home or garden. Cast through bronze. Normally ships in 2-3 weeks. Ships via freight. Like Labradors, Golden Retrievers have a tough outer coat that is water repellent and a thick undercoat. They shed moderately in the winter and summer, heavily in spring and fall. As such, it is normal to find hair all over the house when you have a Golden Retriever. The best thing to do it to groom the dog regularly, preferably daily, or you might find its hair all over your couches and house. In general, the Golden Retriever should be golden in color in shades from light to dark gold. The American Kennel Club only recognizes these colors although off late, there have been Golden Retrievers with a rare white color.